Every woman wants to look good in the morning and she has some secrets how to do this. But if you don’t know how to look great every morning, keep reading, because I’ve got some tried and tested tips for you. Even if you’ve had a sleepless or a crazy drunken night, it’s still possible to look refreshed in the morning. Read on to learn a few tips for looking good every morning. If you suffer from puffiness, you know how terrible it can be to wake up feeling refreshed and full of energy but looking haggard. To prevent puffiness try to sleep with an extra pillow to keep your head on a slightly elevated position. Sleeping with your head slightly elevated helps prevent fluids from accumulating around your eyes and so reduce puffiness. This tip is also great for those who snore. Today, there are many vitamin and mineral supplements available to make you upbeat in the morning, especially if you’ve had too much of alcohol drinks. A vitamin B12 complex or a fish oil supplement can help you feel refreshed, alert and focus better during those busy morning hours. A warm cup of green tea in the morning will help increase your blood circulation, boost your energy level and will make you feel refreshed and full of energy. This is one of the most effective tips to follow if you want to look good in the morning. When you wake up with dark circles under your eyes, give your face a dose of caffeine. It helps reduce dark eye circles and enhance your skin texture by providing stimulation. Place warm teabags over your eyes for a few minutes and you will feel refreshed at once. This technique has helped many people improve their eyesight. Get up early in the morning and go to a park or just sit in your front yard to be amidst nature. Looking at the greenery and freshness of nature around you will instantly make you feel upbeat. Instead of applying foundation, opt for a good vitamin-enriched moisturizer because your body needs to be rehydrated in the morning. A few layers of foundation will only make your skin look dry, dull and completely lifeless. To look refreshed in the morning you may need to highlight your skin. I usually apply a skin highlighter and it helps me a lot! You can use a little bit of highlighter on your forehead, cheek bones and blend the shade to make your face look beautifully luminous. 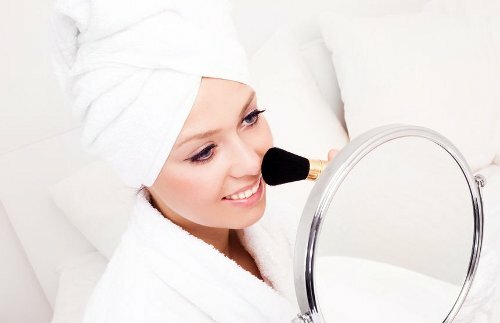 Finally, the last important tip you need to follow to look good in the morning is to opt for a very minimal eye make-up. Avoid wearing heavy strokes of liner. It’s better to use neutral colored eyeshadows, followed by a few gentle strokes of your mascara. To accentuate your lips, use a brighter shade lipstick or a gloss. Follow these tips and you will look amazingly beautiful every morning! But don’t forget to get enough sleep, exercise, drink enough water and eat healthy. These are the most important things for your health. What do you do to look good in the morning? Do you have any tips? Share in the comments, please, and thanks for reading!